Carrycot suitable from birth to 6 months. 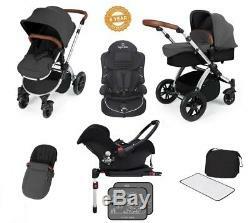 Pushchair suitable from 6 months to 3 years forward & rear facing. Galaxy isofix compatible car seat maximum weight 13kgs. Carrycot comes with flexible hood, apron, safety mattress and rain cover. 6.5kg lightweight aluminium chassis. Leather handle and bumper bar. 360 degree swivel front wheels (with lock function). Deluxe foam wheels for a smoother ride. Built in front and rear suspension. Easy action fold without having to remove seat section. Extra-large easy access shopping basket. 2 x car seat window sun visors. Seguro Bebe Lime Group 1,2,3 Car Seat in Pure Black. The Seguro Bebe Lima Group 1 2 3 Child Car Seat is designed to grow with your child and is suitable from 9 to 36kg. In stage 1 (9 to 18kg), the Lima provides a 5-point safety harness with child proof buckle and a plush child insert with headrest. For stage 2 (15 to 25kg), the safety harness and child insert can be removed and the 3-point safety belt used. Finally, for stage 3 (22 to 36kg) the car seat back can be removed so that the Lima becomes a comfortable booster seat. For messy little ones, the child car seat upholstery can be remove and washed. Available in Beige on Navy, Grey on Black, Pink on Grey and Pure Black. Not suitable for children over 125cm. All Seguro Bebe car seats are designed and made in Europe to meet the highest safety standards.